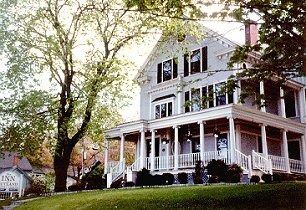 The Inn at Rutland is a elegant 1890's Victorian which has been carefully renovated to provide 12 richly appointed guest rooms, all with private bathrooms, color televisions, and telephones. Each room has been detailed to include the amenities expected by the discriminating traveler, while maintaining a Victorian ambience. The interior is rich with period architectural details, such as the leather wainscotting in the dining room to the leaded glass window over the grand staircase. Our two common rooms offer a comfortable atmosphere for reading or just sitting by the fireplace. Breakfast is served in our formal dining room, and included with your lodging. We are close to all Vermont attractions, and within walking distance to fine shopping and restaurants. The Bed and Breakfast has a carriage house for bicycle and ski storage, and mountain bikes are available for our guests. We are a non smoking Inn, and children are welcome. Sorry, no pets. This and other Killington Bed and Breakfast Inns can be found here in The Register.